Well it now appears official. The Cowboys coaching staff is complete. On Thursday, the Dallas Cowboys rolled out every member of the 2011/12 Dallas Cowboys coaching staff. Each coach was then made available for comment. 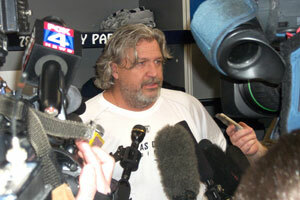 While most of the crowds gathered around Rob Ryan, the Cowboys new defensive coordinator, every coach seemed to have people waiting to talk to them. While a lot of excitement has surrounded Ryan, there has been some curiosity around Ryan’s impressions of the defense he is inheriting. “To be honest with you, I haven’t seen talent like this on a defense in a long time,” Ryan said. “I’m awfully anxious to get going with them. We’re not going to make any excuses we’re just going to win.” Ryan didn’t mince words and spoke every bit as confident as his brother Rex who has gotten most of the headlines throughout their lives. While Ryan stole the show in a lot of ways, the other coaches were also chatty. Former offensive line coach Hudson Houk has added “running game coordinator” in front of his title. Jason Garrett’s brother John has added “passing game coordinator” in front of his tight ends coach title. While the titles are new, the roles are the same since the Cowboys made their coaching change midway through last season. “It’s real close to a continuation of the end of last season,” John Garrett said.